Mercedes-Benz’s second-generation GL-class is more than a sport-utility vehicle. It’s also a big boulevardier with plenty of room for seven passengers, a commanding vantage point, and most of the creature comforts available in the S-class sedan. It can tow 7500 pounds and go just about anywhere, even if the typical owner cringes at the sight of mud. We called it “the S-class for Americans” when we took possession of our Four Seasons test model. Americans bought 29,912 GLs last year, a considerable number for a model that starts at $63,925 (for the GL350 Bluetec turbo-diesel). That’s more than double the sales of the S-class, which Mercedes claims is the world’s best-selling luxury vehicle. 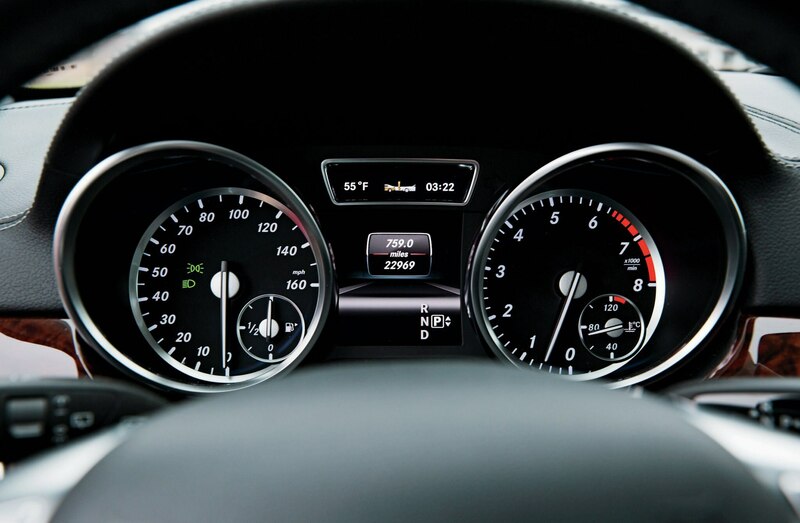 We opted for the midlevel, 362-hp 2013 Mercedes-Benz GL450 with a 4.7-liter twin-turbo V-8. Our Mercedes SUV could be described as low-key luxury: no fashionable Designo trim, nineteen-inch wheels instead of twenties, and a bottom line shy of $80,000. We could easily have surpassed that price had we chosen the GL550, with its 429-hp version of the 4.7-liter twin-turbo V-8 and 1-mpg city/highway penalty on the GL450’s EPA estimate of 14/19 mpg. (And then there’s the GL63 AMG, which starts at $119,085 and has a 5.5-liter twin-turbo V-8 that makes 550 hp.) If our GL450 was an American S-class, it was more like the restrained-content S-classes used by European diplomatic corps and high-end Berlin hotels than the new technology-laden S-class that debuted for 2014. The first-generation GL, introduced for 2007, was initially designed to replace the G-class (a.k.a. Geländewagen). 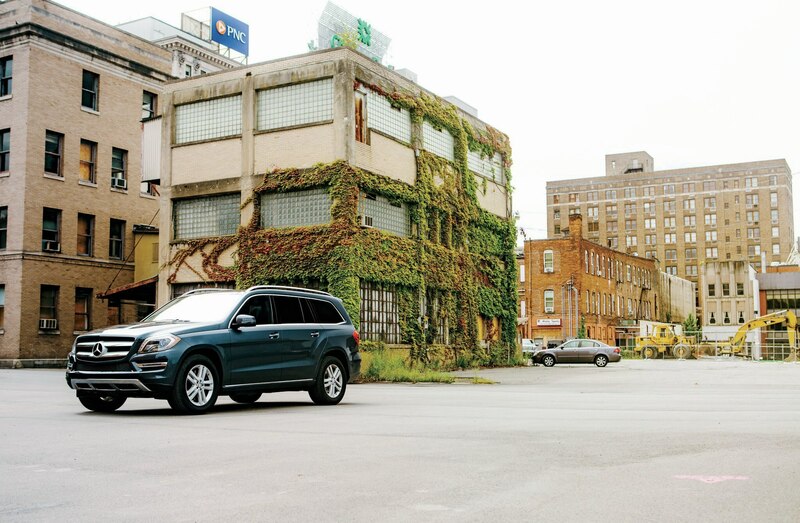 The second-generation GL, launched in the 2013 model year, is a big, blocky vehicle that competes with the Cadillac Escalade rather than tighter, sleeker luxury crossovers like the Audi Q7. 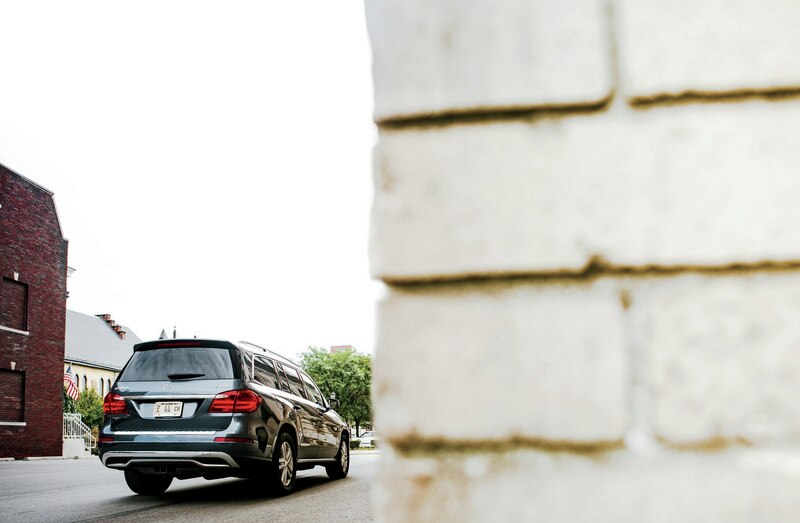 As soon as the 2013 Mercedes-Benz GL450 joined our Four Seasons fleet, we had visions of luxurious family road trips, weekend getaways with friends, and towing adventures. But before we did any of that, we started debating its ride quality and refinement. “The GL’s light steering and outward visibility make everyday driving a breeze,” associate web editor Jake Holmes effused. “And the 360-degree cameras make it easy to maneuver.” Deputy editor Joe DeMatio agreed that the GL450 has carlike moves but lamented the $100 cost of a tankful of premium unleaded. Senior editor Joe Lorio, New York bureau chief Jamie Kitman, and former web editor Phil Floraday were in a different camp. Although the GL is equipped with Airmatic adjustable air suspension, this trio were vocal in their criticisms of its suspension tuning and lack of body control. “Another stint in the GL, another case of motion sickness,” was typical of Floraday’s logbook entries. “Driving it up Park Avenue with four passengers made me pine for the smooth-riding ways of my solid-axle, four-by-four 1968 International Travelall,” Kitman said. On summer vacation in Cape Cod, Lorio appreciated the spacious accommodations and ample cargo room—but not much else. “The GL has none of the poise and polish of an E-class wagon, and it’s miles from the new S-class,” he said. An S-class can’t tow 7500 pounds, though. Copy editor Rusty Blackwell snagged the GL for its first big towing exercise, a 1275-mile round-trip from Ann Arbor to Nyack, New York, to retrieve a 1979 Triumph Dolomite Sprint he was buying from Kitman. Before he left, Blackwell was prepping the Mercedes when he ran into a snag. The owners’ manual lacked instructions for connecting trailer brakes, and Mercedes dealers don’t sell trailer-brake controllers, nor do they stock wiring adapters for connecting aftermarket controllers to Benz SUVs. An electrical-engineer friend who joined Blackwell on the drive performed an impromptu fix by plugging our trailer-brake controller’s four wire leads directly into the Benz’s prewired underdash connector and taping them tight. Problem solved, although not elegantly. On his return, Blackwell towed about 3600 pounds of trailer and car, well below the GL’s maximum capacity. “The Mercedes was smooth and stable, although I wouldn’t have wanted any less power in the Pennsylvania mountains, because maintaining speeds of 70 mph on some of the steeper grades might have been a challenge.” Unfortunately, attaching a trailer sidelines the big SUV’s blind-spot monitors as well as the anti-swerve feature of the lane-keeping assistant. On the whole, though, the 2013 Mercedes-Benz GL450 worked well as a tow vehicle. In general, the GL450 was reliable, but it had more than its share of unscheduled service, some of it covered under warranty, some of it not. Before we clocked 1000 miles, we sideswiped a building to avoid another car, requiring a lot of bodywork and a pricey headlamp assembly. The repairs came to a staggering $10,958.63 and took the GL out of service for about three weeks. At 16,000 miles, we noted some body creaks and a pulsating brake pedal that indicated a problem with the rotors. “The tech says the warped rotors are the worst he’s seen,” road test editor Chris Nelson reported upon the GL450’s return from its second scheduled service. The dealership replaced the front brake pads and rotors for—brace yourself—$923.20 with an updated specification that uses a new material compound. In addition, the front overhead map lights and the twelve-volt outlet for the front row stopped working, and the power-folding third-row seats’ motors went AWOL. It was all fixed under warranty, but before the new seat motors arrived at the dealer, the radio had stopped working. A faulty amplifier kept blowing the fuse, and the dealer took several days to fix it, also under warranty. In anticipation of a long, cold, snowy winter—the last of the GL’s four seasons in our fleet—we replaced the factory-spec Continental all-season tires with a set of Pirelli Scorpion 265/55VR-19 Ice & Snow tires ($1333.40, mounted and balanced). We also installed three rows of WeatherTech FloorLiner mats ($267.85) to help keep the carpets clean. The GL450 spent the holidays in Milwaukee, where road crews use cheese by-products (really) in addition to rock salt to help provide traction on icy roads. 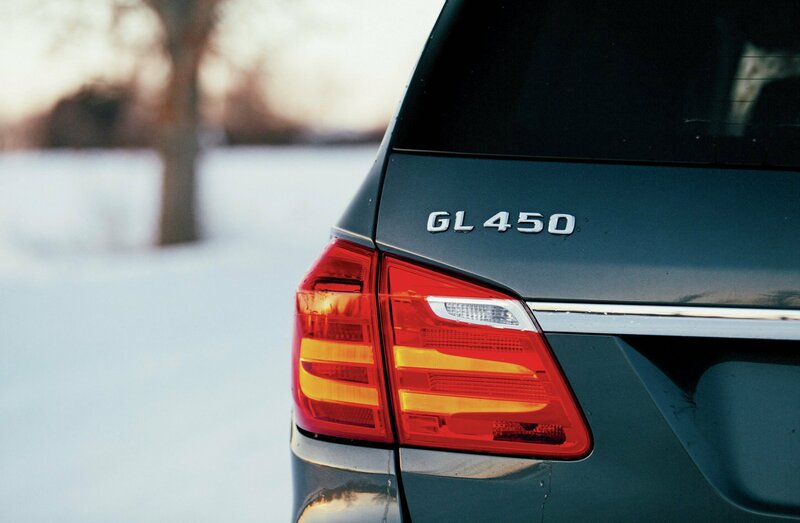 Cheese, salt, whatever—it didn’t matter to us, because 4Matic all-wheel drive, combined with the winter tires, allowed the GL to shrug off difficult conditions. The 4Matic system allows just enough slippage to get started or slide the tail slightly when needed. A heavy snowstorm was no match for the GL as we raced to reach a favorite pizza joint before it closed for the night. 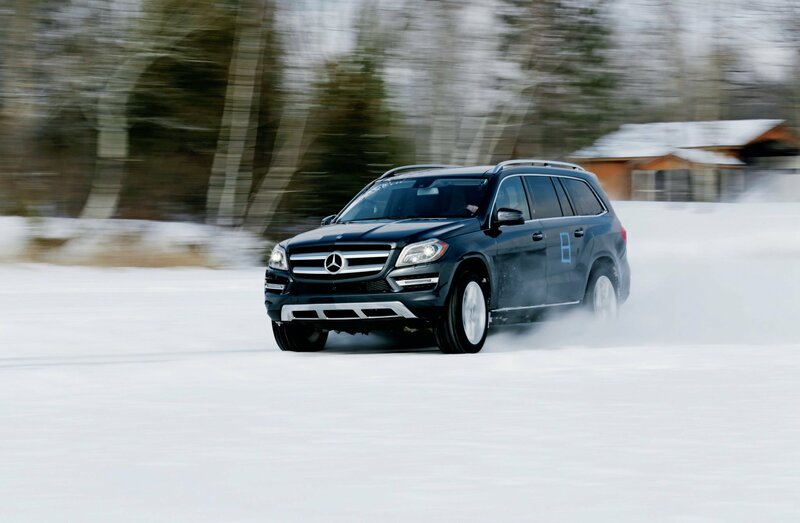 If driving through cheese is rare for a Mercedes GL, we’re willing to bet that ours is the only one that has ever gone ice racing. After fitting a set of 21-inch Pirelli Winter Carving Edge studded tires borrowed from Tire Rack, Nelson took the GL to a small, frozen lake in mid-Michigan, where he earned an SCCA trophy for the studded class (possibly because our 2013 Mercedes-Benz GL450 was the only studded-tire entrant). The Mercedes-Benz GL-class’s strong sales prove that even if none of its owners go ice racing, many of them appreciate the ability to transport lots of people, in most any weather conditions. As a large crossover caught in the market’s transition from truck-based SUVs to tall station wagons, the GL is not refined enough for customers who are looking for the utility version of an S-class. Mercedes ought to use the new Range Rover as a benchmark for what the next GL-class should become. In the meantime, for those who want a large luxury sport-utility vehicle that can comfortably seat seven adults while doing just about anything that a rugged pickup truck can do, the Mercedes GL-Class has few rivals. Production of the G-class began at Steyr-Daimler-Puch (which is now Magna Steyr) in Austria in 1979. The body-on-frame truck has been built as both a two-door and a four-door, with a variety of engine and transmission choices. Gray-market examples of the SUV had been trickling into this country for years before Mercedes-Benz USA officially brought it here for 2002. Mercedes planned to discontinue the G-class with the arrival for 2007 of the new GL-class. Loyal customers objected, and today two versions are available: the $115,125 G550 and the $136,625 G63 AMG. Think of the GL-class as the HUMMER H2 to the military-based H1. The GL shares its basic component set with the Mercedes-Benz M-Class, which began production in Tuscaloosa, Alabama, in 1997. The GL launched a decade later as a bigger, longer three-row version of the M-class. The first model was the GL450, which came with a 335-hp, 4.6-liter V-8 and standard four-wheel drive for a base price of $55,675. Its replacement for the 2013 model year, our Four Seasons example, is an evolutionary update that’s highlighted by Mercedes-Benz’s move to downsized, turbocharged V-8 engines.